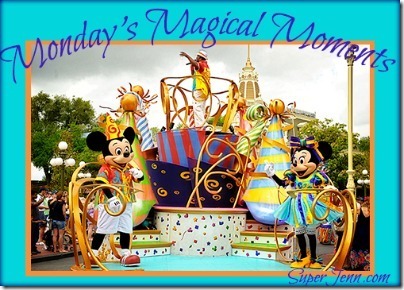 For 2013, Disney has launched Limited Time Magic where something new and exciting will take place throughout the year. Recently, I watched friends and family members share photographs from their time at Walt Disney World during Long Lost Friends Week. Although I was not able to make it there to see Flik, Clarabelle Cow, Remy, Tweedle Dee, Tweedle Dum, and all of the Robin Hood gang, I knew that I had something fitting. 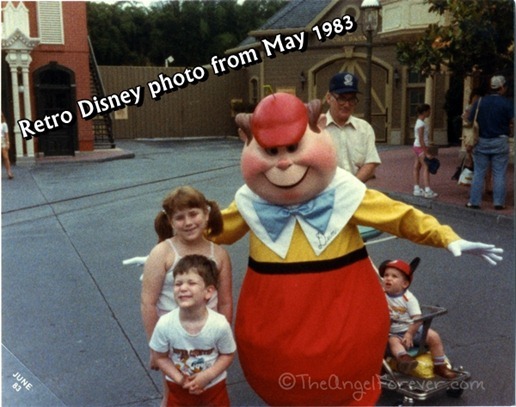 Here is a photo from a long lost magical trip to Walt Disney World. This retro photo from May 1983 is with Tweedle Dum, my little brother, and I am sporting pigtails. We were enjoying the day at the parks. This trip would also be our first chance to see the newly opened Epcot. If you look closely at my brother, he also had a vintage shirt on. Yes, it is for River Country which closed in November 2001. So many magical memories and a day with a character that is rarely seen. What is your favorite retro or rarely seen Disney character? I would love to know and hear all about your experience.